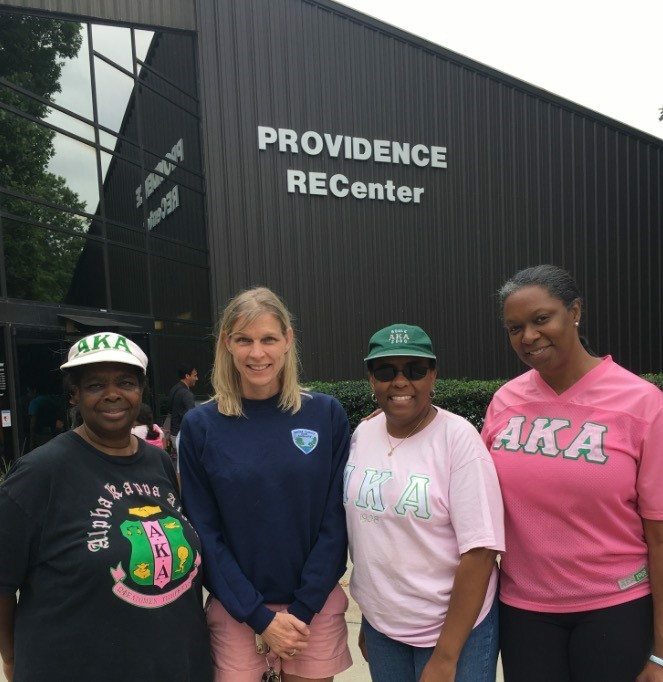 Providence RECenter was thrilled and honored to welcome the Lambda Kappa Omega Chapter of Alpha Kappa Alpha, Inc., sorority to our grounds this Spring in conjunction with their Educational and Charitable Foundation’s National Impact Day Project. Almost 40 volunteers selflessly gave their time and service to restore, refresh and renew the grounds of Providence RECenter. Their herculean efforts were in honor of the sorority’s National Impact Day on May 20th, although this dedicated group prepared and worked hard leading up to this day as well. In addition to providing all of the labor, Sorority members visited the site multiple times to best assess the needs and inspected the current condition of the landscaping. They took it upon themselves to go beyond the initial tasks at hand and began brainstorming about how to best make their impact within a modest budget. After looking at the existing planters lining the entrance, they researched refurbishing them, and sourced out the appropriate sorority volunteers to add that to their growing task list. After their chapter meeting, the group generously offered to not only supply materials needed for the refurbishments, but to donate all of the necessary mulch and flowers for the beautification project. Providence Staff cannot begin to show their appreciation enough for all of the love and attention received. Thank you, Alpha Kappa Alpha!